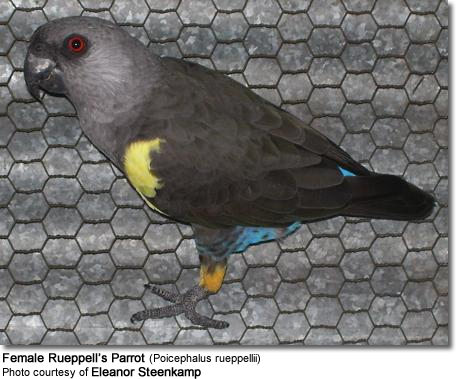 The Rueppell's Parrot or Rüppell's Parrot (Poicephalus rueppellii) is endemic in Southwestern Africa, specifically central Namibia and southwest Angola to Luanda. They are usually seen in small flocks of up to 20 - but more can congregate in areas where food is plentyful. Their preferred habitats range from riparian woodland to Acacia, dry steppe and thornveld as well as palm tree stands, such as Northern lala palm in the northern parts of its range. In its southerly range, it generally occurs in mixed Acacia woodland and cluster-leafs stands. This species is generally more common near streams or rivers. The name commemorates the German naturalist and explorer Eduard Rüppell. The reported maximum longevity in captivity is 34.3 years. The Rueppell's Parrot averages 8.5 - 9 inches or 22 - 25 cm in length (including tail) and weigh around 4.1 oz or 116 g.
The plumage is mostly dark brown and its head is dark greyish. 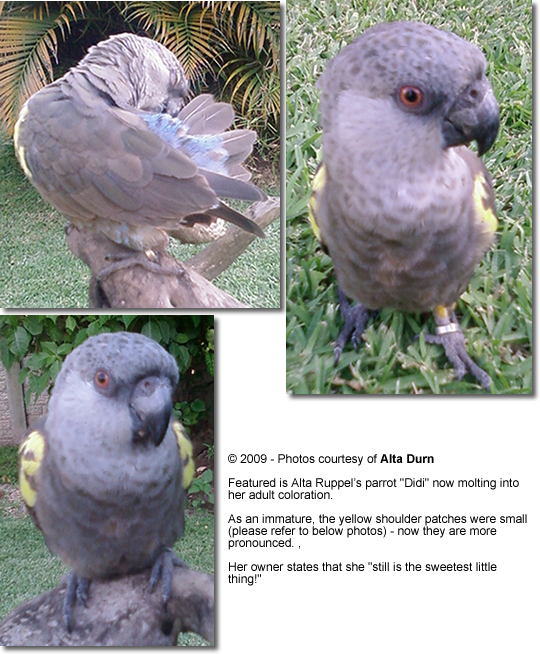 Both adult male and female birds have some yellow markings on their wings and upper legs. Adult female birds have blue feathers on the lower back and the rump. Males may also have some blue feathers, but they tend to be less extensive and fainter. 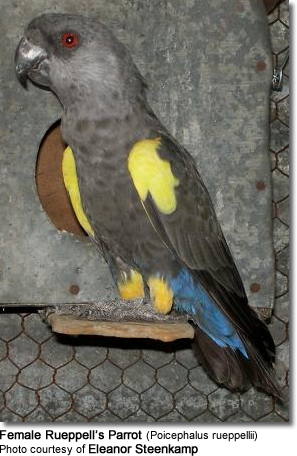 Male birds loose this blue feather coloration as they mature. The irises of the adult birds are a distinctive red. Immatures look like adults, but overall duller and in most cases lack the yellow to the thighs and bend of the wing. Although some chicks have a large amount of yellow, but these yellow feathers tend to molt out as they attain their adult coloration. Young birds have dark eyes - which easily distinguishes them from the adults who have red eyes. The adult coloration is probably attained by 14 months. "They are one owner birdies ... my one is so jealous.. My daughter is not allowed to come close to me or she runs to go and nip her.. Although she loves to play with her when I am not around. In their natural habitat, Rüppell's Parrots nest in tree cavities, either natural or excavated by woodpeckers. The breeding season usually commences in January and continues until June. The average clutch consists of 3 to 5 white eggs, which are incubated by the female for about 24 to 30 days. The chicks leave the nest when they are about 68 days old. In captivity, the chicks stay in the nest for about 50-51 days. Their natural diet varies according to the time of the year. They eat a range of plants and occasionally insects. Their diet consists of seeds, buds and shoots of the Acacia flowers; fruits of Grewia (raisins), Ficus (figs) and Combretum (bushwillows); nectar of Tapinthus (mistletoes); as well as caterpillars and spiders. Dietary needs of the Senegal / Jardine Parrots. Although this species is not threatened at this point, its numbers are declining as its popularity as pet increases. The wild population is estimated to be about 9,000 individuals. Rüppell`s Parrots are nomadic to a degree, which makes it harder to the estimate its population numbers. Illegal trapping has been blamed for the declining flock sizes in very recent years. 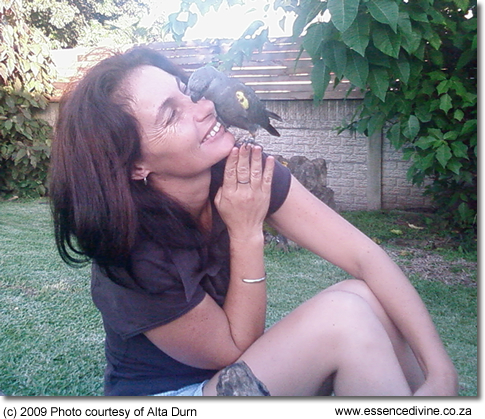 An estimated 600-1000 birds are exported annually to South Africa and Europe , about 60-70% of which die during transit. Furthermore, the Rüppell`s Parrot is also vulnerable because of its restricted range, much of which has been converted into farmland. This protected species is listed on CITES Appendix 2 since 1981. (Ref. : Hockey PAR, Dean WRJ and Ryan PG (eds) 2005. Roberts - Birds of southern Africa, VIIth ed. The Trustees of the John Voelcker Bird Book Fund, Cape Town). 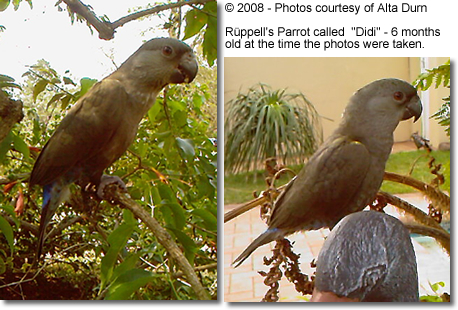 Rüppell`s Parrots are generally quieter than the other Poicephalus parrots. Their contact calls are described as monotonous, quick and sharp notes; while their alarm calls are shrieks increasing in pitch.